Baked Feta - feta marinated in olive oil, red pepper flakes, lemon zest, garlic, pepper, oregano and baked. SO easy and SOOOO delicious! Great for parties! Serve with french bread slices or pita chips. This Baked Feta was inspired by a local pizza place. It is so simple, yet it tastes amazing. I ate way too much of this dip. Feta marinated overnight in olive oil and herbs and then baked. SOOO good! It makes a fantastic holiday party appetizer! I marinated the feta in a ziplock bag and let it hang out in the fridge overnight before baking it. If you don't have that much time, just marinate it as long as you can before baking. 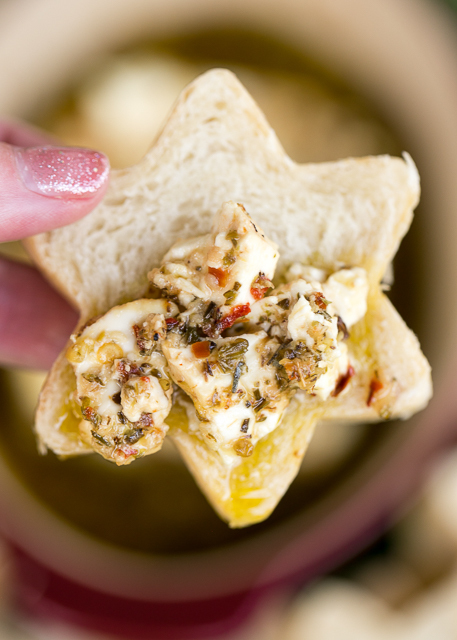 We served the feta with some festive bread slices. I used some canapé bread tubes to make the star shapes. I put a can of refrigerated French bread in the tube and baked it. Once it had cooled, I sliced it into thin slices. It makes a fun presentation! If you don't want to buy the bread tubes, you can serve the Baked Feta with some regular French bread or crackers. Place feta in a ziplock bag. Whisk together olive oil, red pepper, lemon zest, garlic, black pepper and oregano. 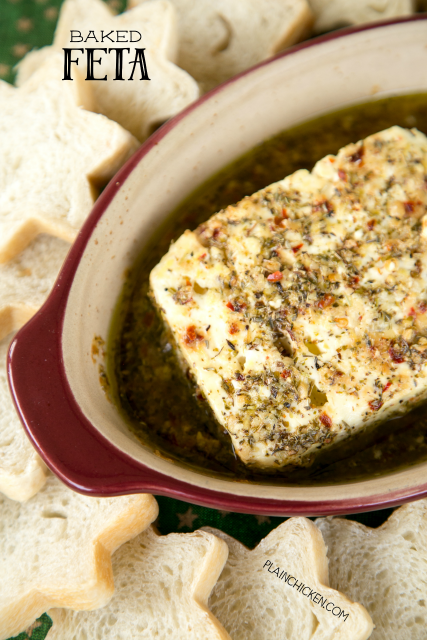 Pour over feta and let marinate for 30 minutes at room temperature OR overnight in the refrigerator. Place feta and marinade ingredients into a small cseramic dish. Bake for 20 until feta becomes soft and slightly golden brown. Serve with french bread slices or pita chips. I will be making this recipe very soon. I use the refrigerated Pillsbury French Bread. I spray the bread tube with Pam and unwrap the dough. I stuff the unbaked dough into the tube. You will need to cut off about an inch of the dough and then bake it. You can stand it up or lay it down. Either way works fine. It makes a great presentation! Enjoy! This is so delicious! I could have eaten it without bread :) I bought a double pack of feta at Costco, and will definitely be making this again soon! I made this for Christmas Eve. Initially it was wonderful when it first came out of the oven, but after it cooled it was hard as a rock. Could I have done something wrong? Or did anyone else have this problem? I didn't have that issue. Could be the brand of cheese?